To find your local Ultrasky approved installer, simply fill in your details, and we’ll pass them on to three carefully selected and fully vetted companies that we trust in your area. They will then contact you directly to discuss your project and provide a no obligation quote. We insist on the same quality from our installers as we do from our products, so you can be assured of the very highest standards of service and workmanship when you choose from our recommendations. Trusted Traders approved by Which? 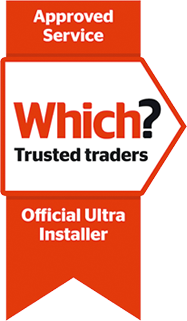 The Ultrasky Ultra Installer Scheme is endorsed by Which? and is one of just a handful of services in the country to carry the Which? Trusted Traders Ribbon as an 'Approved Service'. All installers are regularly inspected by both Ultrasky, as well as independent Which? inspectors, to ensure that they maintain the highest standards, treat customers fairly and have the appropriate processes in place to guarantee complete customer satisfaction. Complete your details now to get up to three free quotes. Your chosen Approved Ultra Installer will deliver a complete service from concept to completion, giving you complete peace of mind. With a set timescale and a set budget, you’ll always know where you stand. We choose all of our approved installers carefully, so that you can choose with confidence, knowing our high quality products will be installed with the care and craftsmanship they deserve.